On the way home from my basketball game tonight, I decided stop by Burger King. I pulled up to the drive-thru and ordered a Tendergrill Chicken Salad. “We’re all out of salads tonight” came the reply over the intercom. 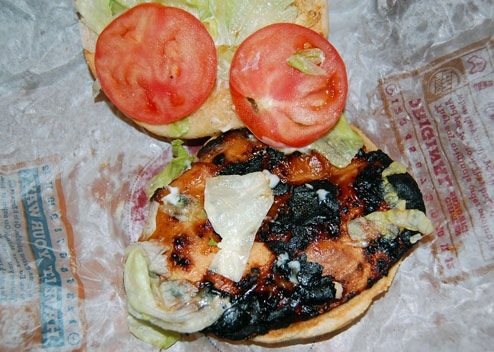 I looked over the menu for a grilled sandwich and stumbled upon the Tendergrill Chicken Sandwich. And it’s in stock! Also in stock was a large Diet Coke so I order one of those too. Six bucks and change later, I’m heading home with a late dinner. It’s grilled all right but it’s far from tender. Only the buns look vaguely similar. Normally I would have returned the sandwich and asked for one that doesn’t look like a nasty third degree burn. But it was now 11:30 pm and I live a good 15 minutes from the Burger King. So I decided to stay home, take a few pictures and pour a bowl of Frosted Flakes instead. That is NASTY! Which Burger King? I want to make a point to never ever EVER go there. I looove burnt things. Oddly enough that photo made me hungry. This is occurring more frequently for me as well. That food either isn’t prepped correctly or it’s the wrong order all together. Definitely take these shots to BK’s feedback line. Oh man Brett. I’d contact BK customer service. They’ll probably hook you up with burned chicken sammiches for life! I will never complain about finding foil inside my Carl’s Jr. burger again. This definitely beats that by far. I agree with Pamela. Negotiate like Michael Scott and get burned sandwiches for life. I’ve learned to avoid fast food places late at night. Quality control dips considerably when the night manager is on duty. Also, I think they’re trying to get rid of the day’s leftovers. Seems to happen quite a bit. I always try to check my order, but there’s no way to check for that before you pull away. 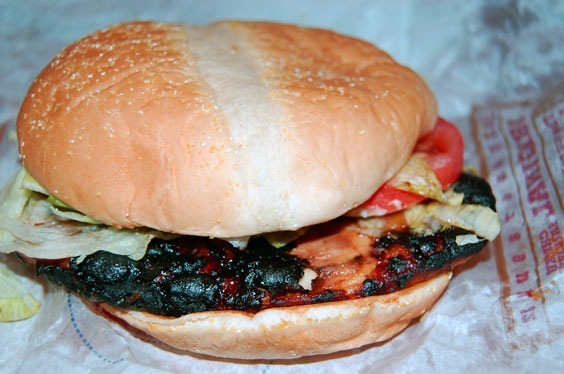 I with Marina, I love burnt things too. Looked really good (except lettuce).